After the police having remained clueless in the seven-day-old kidnapping case of Prabir Singh, it has drawn up a comprehensive strategy to nab the culprits. No one bothered about the amenities in jail ever before Ms Kiran Bedi launched a unique drive to comprehend the problems being faced by Tihar Jail inmates. She became a role model for other jail authorities after she succeeded in conditioning the mindset of people behind bars. The Punjab State Ministerial Services Union, having the strength of one and a half lakh employees, will launch an agitation from March 9 to press the state government to accept its 30-point charter of demands, including time-bound promotion on the basis of four to nine to 14 years formula. She became what she is because of her father who made his house a centre for music lovers of Nowgaon in Assam to ignite the love for music in his eldest daughter. 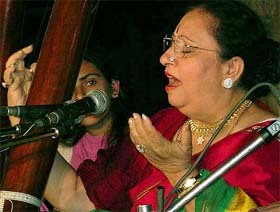 Today classical vocal singer Begum Parveen Sultana is returning a part of this legacy back to the music fold by encouraging budding artistes in her own unique way. Savita Devi exudes earthiness of the Ganges. Her utterances are heavily reminiscent of holy chants, her philosophy an extension of the ideology which Banaras has nurtured in its bosom for ages. Shujaat Hussain Khan literally commanded the gathering at Quila Mubarak last evening. 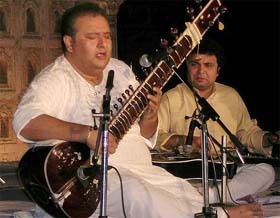 Exhibiting rare artistry, he struck nostalgic melodies on the sitar, weaving a spell in which the seemingly complex world of classical music appeared mighty approachable. The Indian National Trust for Art and Cultural Heritage has decided to replicate its Jaisalmer experiment in Patiala by becoming a catalyst for the formation of a ‘Quila Mubarak in Jeopardy’ trust on the pattern of the ‘Jaisalmer in Jeopardy’ fund established in the United Kingdom. The SAD and BJP workers today organised a march on Mukerian-Talwara road to protest against the poor condition of roads. Hundreds of workers led by the former SAD minister and SGPC member from Gurdaspur, Mr Sewa Singh Sekhwan, organised the march on two and four wheelers. The Shiromani Akali Dal President and former Chief Minister, Mr Parkash Singh Badal, urged the Chief Election Commissioner to ensure that the anomalies in the electoral rolls in the Ajnala Assembly constituency were rectified before the polling date. Capt Kanwaljit Singh, former Finance Minister, while addressing the annual function of Punjab State Karamchari Dal here today said the Punjab Government had failed on all fronts and every section of society was annoyed with it. The family of Dr Jit Singh Khokhar, popularly known as ‘Professor Sahib’ in the town, is running from pillar to post to get his dues. The eminent scholar and holder of seven master degrees had written 44 books. Before his death, he was teaching Sanskrit at Government Sanskrit College here. Ms Komaldeep was adjudged the best dancer among girls at the Basant Festival that concluded on the D.A.V. College campus here last night. Ms Komal Midha received the second prize from the chief guest, Mr Jackiran Singh, SDM. Valentine’s Day was strongly protested here today by activists of the Bajrang Dal, the Vishwa Hindu Parishad and women activist of the Durga Vahini, sister organisation of the Bajrang Dal. In a significant development which could have far reaching political consequences Ms Jagdeep Kaur, Civil Judge, today issued summons to Mr Gurpreet Singh, brother-in-law of a former Chief Minister, Mr Parkash Singh Badal, to appear in the court in connection with the suit filed by his second wife Ms Preet Kaur. Even though experts are raising doubts about the success of contract farming, this mode of farming is slowly and steadily gaining some popularity in certain parts of the region. Manawala village (located on Ajnala — Chogawan road) is about 26 kilometres from Amritsar city. The police yesterday arrested a Pakistani “terrorist” who had been posing as a social activist for a long period in this town. A special investigating team, constituted under the supervision of Mr Mukand Singh Malhi, DSP, Malerkotla, and Mr Balraj Singh, SHO, arrested Mohammad Pakir at a naka near here. Close on the heels of sensational kidnapping of a DAV Public School student and son of rice exporter, Prabir , a 78-year- old widow, Saroj Sagar (78), a resident of the posh Lawrence road area, was allegedly killed late last night. Three persons — a security guard of the Tarn Taran SSP and two women — were killed and more than 20 injured in two separate road accidents on the Tarn Taran-Khadoor Sahib road today. A 15-year-old student has been reportedly missing under mysterious circumstances from Nehru Gardens since last evening. Satyam Sood, a student of Army Public School, went to a barber shop to a hair cut last evening. The Ropar police today rounded-up boys for teasing girls outside Government College. Things took an ugly turn in the afternoon when two groups of students clashed over the giving of a card to a girl of Government College, Ropar. NRI youth Gurjit Singh(28) was allegedly attacked with sharpedged weapons and killed by assailants in nearby Bhaini village in Phillaur subdivison last night. Gurjit Singh was rushed to a private hospital in Ludhiana, where he succumbed to his injuries this afternoon. A city resident has alleged that a team of the Punjab Police cops had forcibly got his kidney removed two years ago for the brother of an SP-rank official. All entry points to Ajnala were blocked today to thwart an attempt by the Elementary Teachers Training Union to hold demonstration here. The by-election is scheduled to be held in this constituency on February 23. Thousands of teachers working in government aided schools in eight districts of Punjab held a march here today to lodge their protest against the stopping of facility of pension which they have been getting for the past 18 years.